The clocks have gone forward and by the looks of it, there are lots of sunny days ahead (fingers crossed). To celebrate the arrival of the new season, I'm going for a slightly different post today where I show you how I'm switching up my wardrobe to get ready to step into Spring. 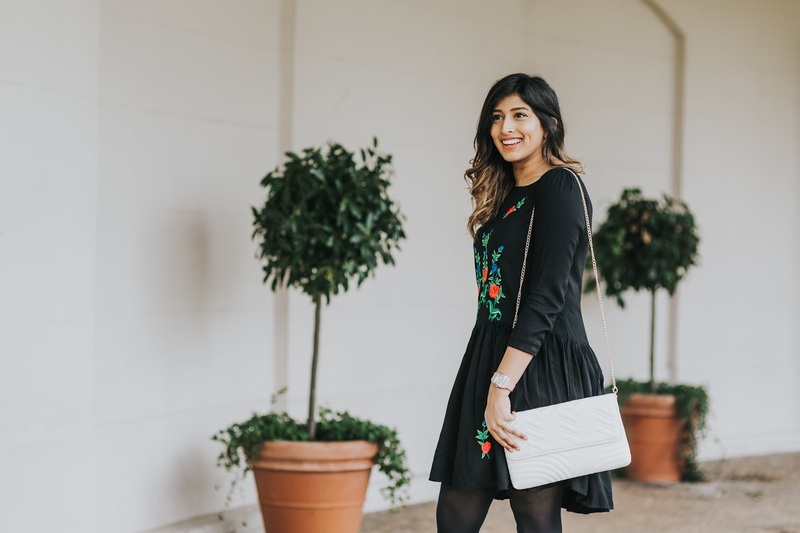 As much as I'm trying to incorporate more colour into my wardrobe, I love a good LBD, so I decided to pair this dress from Primark with some of this year's SS17 trends to put together an outfit ready for the warmer weather. Although the outfit is simple, from the floral embroidery on the dress to the white Lottie* bag from Koko Couture's Spring collection, I love the details that pull this look together. When deciding which accessories to pair with this almost all black outfit, I knew I wanted to be a bit playful and add some personality to this look. Just as I was switching up for wardrobe for Spring, Koko Couture got in touch and kindly asked me if I'd like to try out of the bags from their new Spring collection and honestly, I was spoilt for choice - the collection is beautiful! Typically, I'm someone who goes for black bags because they go with everything, but after seeing the collection from Koko Couture, I was inspired to go for something different. I went for the Lottie* clutch which retails at £18. This soft faux leather bag contains one main compartment but has a small zip pocket as well as two small pockets on the inside. 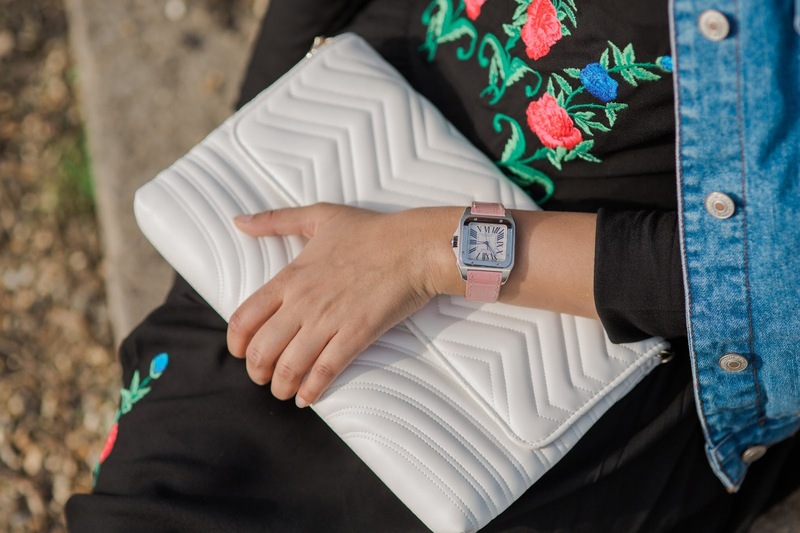 What I love about this bag is that it's versatile, you can either wear it as a clutch, or you can attach the detach gold chain strap it comes with for more practical wear. Although I went for a white bag, the Lottie comes in various different colours and you can find it (with many others from the Spring collection) here, as well as in store in some Topshop stores. I finished off the outfit with my beloved Cartier Santos 100 which has beautiful baby pink leather strap, black chelsea boots and my blue denim jacket because it's not warm enough to go without one yet. That's all from me for now. 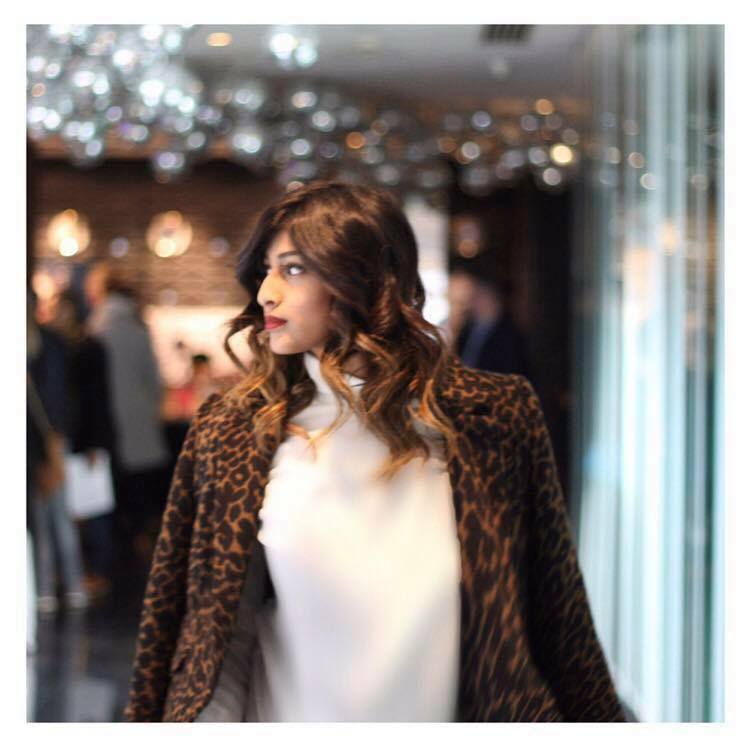 I hope you enjoyed this post - I know it's a bit different but if you'd like to see more fashion related posts, let me know. 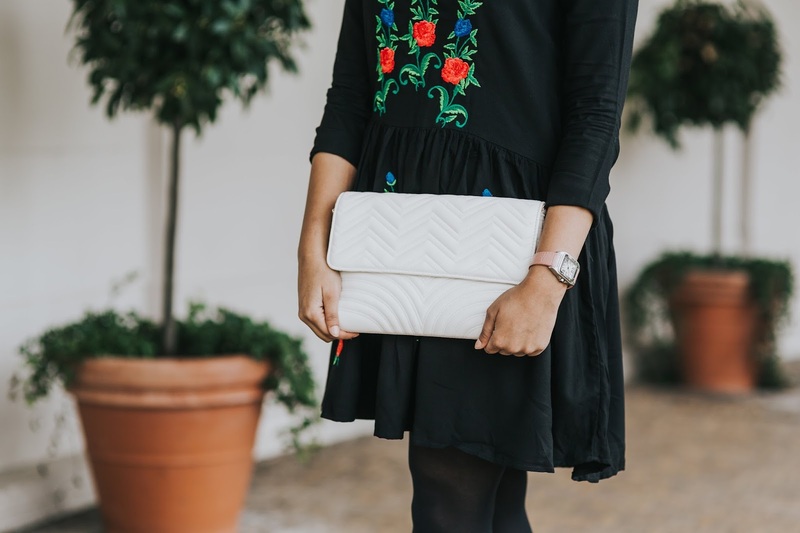 A massive thank you to Koko Couture for letting me style this lovely bag, and to Anneka from www.annekaphotography.co.uk for helping me with the pictures! How are you stepping into Spring? Are there any trends you're currently loving?